The Breakdown: The SEC Has Charged Goldman Sachs With…What? The SEC has filed a civil suit against Goldman Sachs for their role in exacerbating the sub-prime mortgage crisis by producing risky investment options. 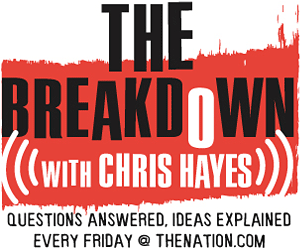 On this week's The Breakdown, Hayes discusses the case with blogger, author and economist Simon Johnson. For the last few weeks, the news cycle has been dominated by the financial industry, and the continued struggle to enact reforms on the giants that precipitated the global economic meltdown. In the wake of endless panels, congressional hearings and infuriating claims of total innocence (by everyone from Alan Greenspan to Lehman Brother’s Richard Fuld), the US Securities and Exchange Commission took action. Last week, the SEC filed a civil suit against heavyweight Goldman Sachs for their role in exacerbating the sub-prime mortgage crisis by producing risky investment options. On this week’s The Breakdown, DC Editor Christopher Hayes discusses the complexities of the case with the prolific blogger, author and economist Simon Johnson. Simon and James Kwak’s invaluable blog, The Baseline Scenario, and their new book, 13 Bankers. The SEC filings and press release on the suit. Tim Fernholz at the American Prospect sums up the charges and implications. John Carney’s Daily Beast post mentioned in the podcast.